West Side Story | …to be continued. As promised, here’s the post about the rest of my Saturday after the Rockette Experience in the morning! After the workshop, I called up my friend Matt who was coming in to the city for the day with a few of his friends! Matt took the bus down from our school in MA and I was eager to see some familiar faces! We met up at Burger Heaven on Madison and 42nd where we caught up over some deliciously greasy food. When my stomach was no longer growling, we made our way down 5th avenue, admiring the decorated buildings and groaning over how ridiculous the crowds were on the weekend. Of course, we saw the tree, but I told him he had to go back later when it was dark and he could really appreciate it! As we made our way towards Central Park we stopped to see some amazing street performers! They were obviously well rehearsed and very funny! They had a lot of great tricks, but I managed to get my phone out to tape their grand finale! When the crowd had dispersed, we continued down fifth ave and into Central Park. We all agreed that it was nice to be in the park but still see the skyscrapers of the city. We went to the skating rink, but only to watch as there was a huge line! Matt and I in the park! Behind us you can sort of see how packed the ice was! After a long walk through the park with Matt and his friends, I had to get some shopping done! I left the boys at Columbus Circle and hopped on the train to head back to Bryant Park. The park was so fun, filled with vendors surrounding the rink and a Christmas tree decorated in blue and white. While I watched the skaters on the rink, I heard a group of girls asking someone whether that was the New York tree. As he explained that, no, this was Bryant Park, not Rockefeller, I imagined how amazed the girls would be when they finally saw the real tree if they thought this one was impressive! I browsed through the vendors looking for gifts for my mom and my sister…but I couldn’t find exactly what I had in mind. I knew to get my sister what she really wanted, I’d have to head down to Canal Street, so I made my way there. After a very long and complicated process, I found a great gift for my sister…but seeing as she might read this, I’m not giving anything away! At this point, I was really getting wiped out. Battling through weekend holiday crowds in the city is exhausting! I was getting really tired of being pushed and shoved around and decided it was time to get some food before going to meet the other interns at 47th and 7th to see West Side Story! I stopped for dinner Europa Cafe, ordered chicken soup and some cheesecake, and took a seat at the only open table, which was a table for four. It was wicked crowded in there, and sure enough, two women asked if I minded if they sat with me. I of course didn’t mind, and invited them to sit down. One of the women had on elaborate makeup, false lashes, huge hair, and rings on every finger. I should have guessed where she was from before I asked: Vegas. I actually had a really nice time sitting and chatting with two strangers over dinner. 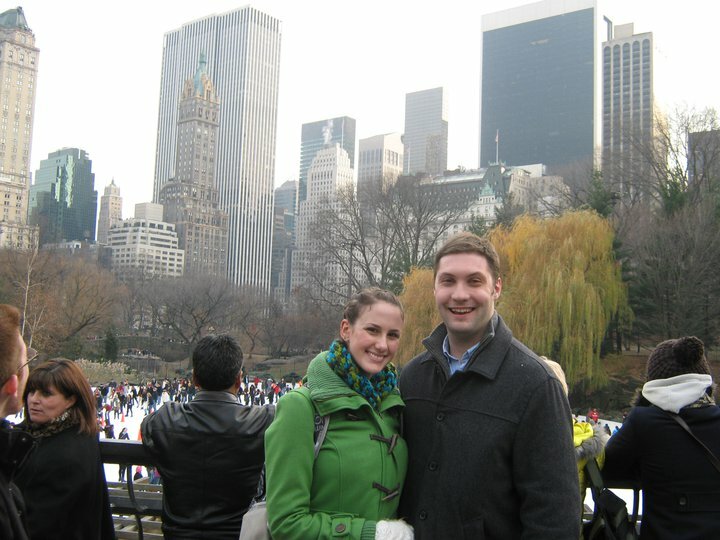 They were both from Vegas visiting for a few days and they were happy to tell me about what they’d done in the city, as well as hear about what I do in the city. “Is it always this crazy?” The woman with the huge hair asked. “It’s a lot worse on the weekends, and since the tree was lit it’s just been mass chaos,” I explained. At 7 I had to bid my new friends goodbye. They wished me luck with my dancing and waved goodbye. Full of warm soup, I happily made my way to Times Square, a little more tolerant of the pushing and shoving. 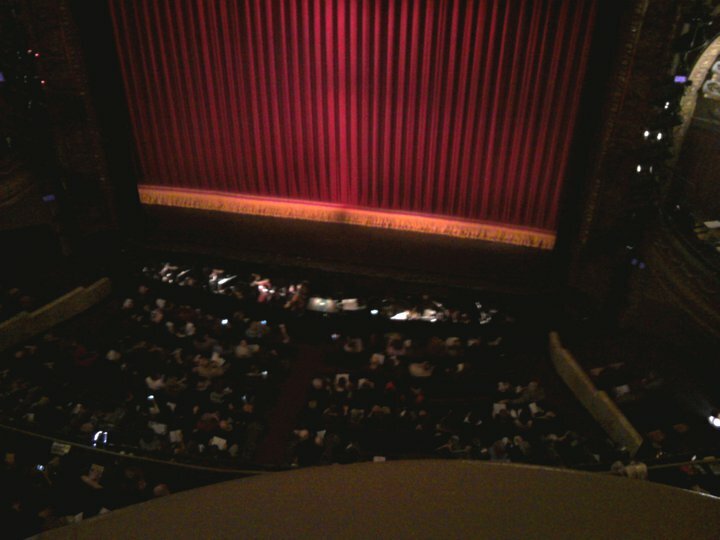 I met the other interns at the theater and we followed the usher’s direction to our seats way up in the third mezzanine. I was almost dizzy as we took our seats, we were so high up! The play was, of course, really amazing. From way up there I could really appreciate the formations and the intricacy of the choreography. There were some really amazing dancers in the cast, and the actress who played Maria had a spectacular voice. Now I really understand what my teachers mean when they say you have to perform for the entire theater, even the audience up in the mezzanine. When the actors were looking straight out at the orchestra level, I felt like I was just observing from above a play that I wasn’t really invested in. It was when the actors projected their characters all the way up to us (which is very difficult) that I felt included in the story. I had seen West Side Story back when my high school did it one year, but it was a whole different experience to see it on Broadway. The entire cast was extremely talented…obviously…they’re on Broadway! I forgot how sadly the play ended. When the curtain fell I was definitely left feeling the heavy message the play was trying to send. The whole way home the interns couldn’t stop humming I feel pretty, oh so pretty, I feel pretty and witty and briiiiiightttt! When I finally fell into bed it was 18 hours after I had left it that morning. After a long day of dancing, walking around Manhattan, shopping, and battling the crowds, I spent today in my pajamas, eating Oreos, and getting odd jobs done in preparation for my last week in the city! I can’t believe it! 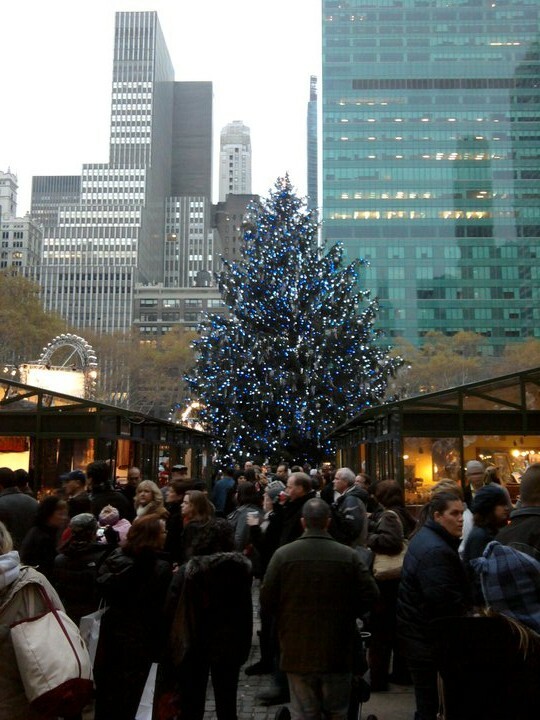 This entry was posted in NYC and tagged bryant park, burger heaven, canal street, central park, europa cafe, fifth avenue, ice skating, rockefeller tree, shopping, times square, west side story. Bookmark the permalink. ummm…mention of mom and ugly for christmas shopping…. you’re already done, dad! don’t you worry! Mere. I can’t believe it’s your last week there~time has flown, don’t you think? I am walking the walk, eating the food, all that you describe so brillantly. Thanks for keeping us all up to date on things and I can’t wait until we are all together during the holidays. XO Auntie M.